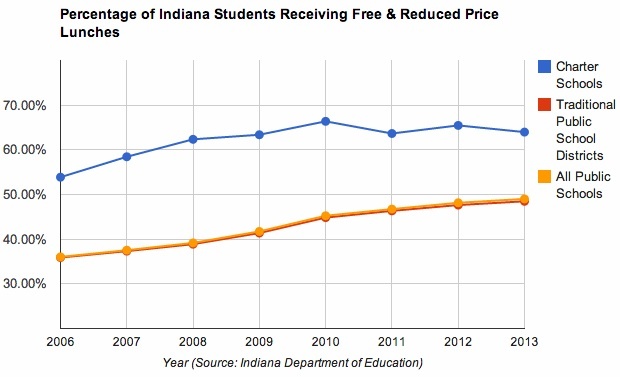 From 2006 to 2013, the percentage of students who receive free or reduced price lunches in Indiana public schools has jumped 13 points. Students considered to be “low-income” now constitute majorities of the public school populations in 17 states — mostly in the American South and West — according to a recently-released report. And while Indiana public schools aren’t quite at that point yet, they’re coming awful close. Forty-nine percent of students enrolled in Indiana’s charter and traditional public schools receive free or reduced price lunches. That’s a 13-point increase from 2006, mirroring a national trend that the intervening economic recession only partially explains. “There has been a steady increase in the number and percentage of low income students attending America’s public schools for a much longer period of time,” researchers at the Southern Education Foundation write. How you interpret this trend likely depends on where you stand in a bigger debate in education policy. On one hand, some advocate for fixing American schools as a means of solving a burgeoning poverty problem. Others say poverty itself, not American education, is the problem. Within the next few years, it is likely that low income students will become a majority of all public school children in the United States. With huge, stubbornly unchanging gaps in learning, schools in the South and across the nation face the real danger of becoming entrenched, inadequately funded educational systems that enlarge the division in America between haves and have-nots and endanger the entire nation’s prospects. But Indiana’s schools of choice also have seen increases in their low-income populations. In 2010 — the last year the state’s enrollment figures include low-income enrollment numbers at private schools — roughly 11.3 percent of Indiana private school students received free or reduced price lunches. It’s safe to say that number has grown as the number of Indiana students receiving vouchers to attend private schools has soared. Last school year, four in five voucher recipients also received free or reduced price meals. In a large swath of the country, classrooms are filling with children who begin kindergarten already behind their more privileged peers, who lack the support at home to succeed and who are more than likely to drop out of school or never attend college. “This is incredible,” said Michael A. Rebell, the executive director of the Campaign for Educational Equity at Columbia University, who was struck by the rapid spike in poverty. He said the change helps explain why the United States is lagging in comparison with other countries in international tests.